In order to start earning DIAMONDS (also known as STORE CREDITS), please register with an account. Diamonds (aka STORE CREDITS) will be automatically accumulated and will be credited based on every S$1 spent. Base currency for DIAMOND conversions will be based on SINGAPORE DOLLAR. Other currencies will be automatically calculated and system credited accordingly. 1. Is there a minimum spending before one qualifies for DIAMONDS accumulation? No. 2. How many DIAMONDS does amount spent translate to? S$1 = 1 DIAMOND. 5. Are there any conditions imposed on accumulation? Sale items + Shipping/Postal Charges are not qualified for DIAMOND accumulation. 6. Are there any conditions imposed on redemption? Minimum purchase per order: S$20 + Not valid on sale items and Shipping/Postal Charges. 7. What is the minimum block for redemption? Redeem upon every accumulation of S$5 worth of points. (i.e. : every 50 diamond points). 8. I have invited my friend but i've yet to receive my DIAMOND Credits and S$5 cash credit. Why? DIAMOND Credits and Cash Credit will only be awarded upon the referee (friend you'd invited) making their 1st purchase. You'll receive an email when Refer-A-Friend Diamonds have been credited. 9. How does the Birthday Discount work? Simply spend more than S$20 in a single purchase (excludes Sales items) and enjoy the discount at checkout. No code is required. 10. Do you have a showroom? 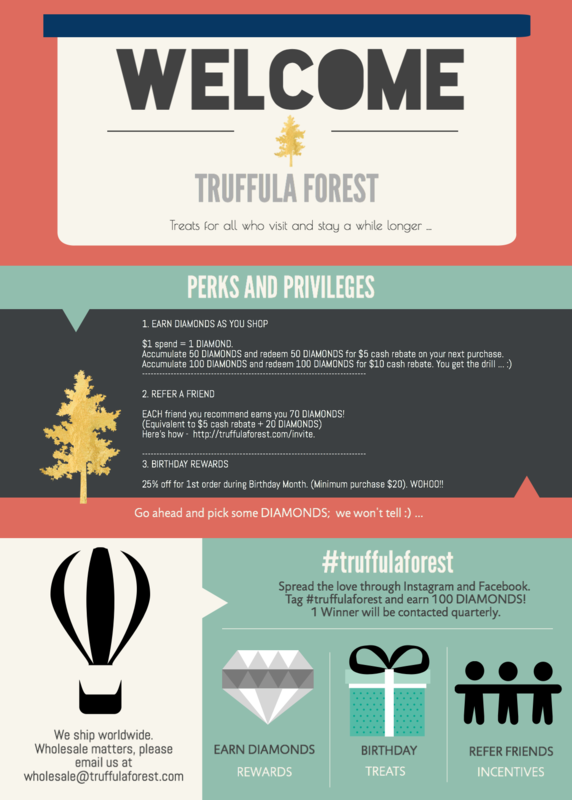 Truffula Forest operates purely as an online lifestyle concept store to cut the additional costs of maintaining a showroom. That is how we pass on our savings on overheads on to you in the form of lower prices.